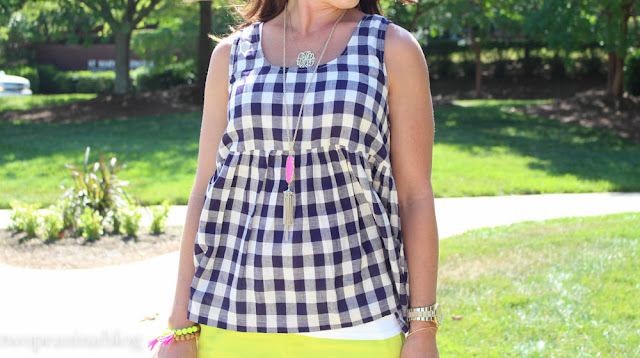 I have always loved gingham. Mostly I wear it in the fall and spring as a button down shirt, which unfortunately are too hot for the summers in NC. But this summer there are some adorable gingham pieces available!! 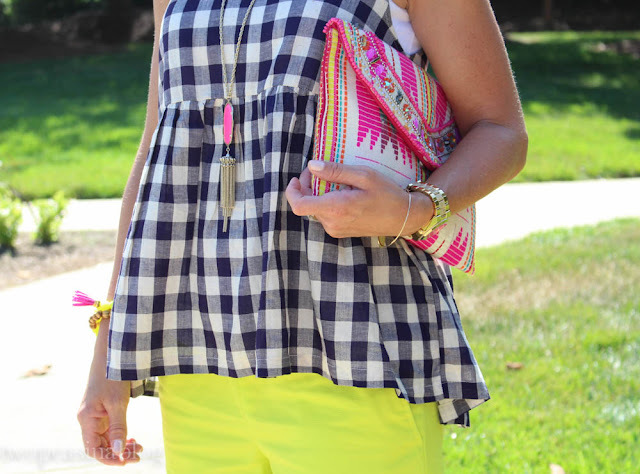 I fell in love with this baby doll gingham shirt when I saw it on Instagram. It is from The Hidden Trunk boutique and as soon as I saw it here, I bought it. It is navy and natural, so not a true white. And it is light and flowy , perfect for summer. I wore it to dinner with white jeans and heels and loved it. Here I decided to add some bright colors, so I paired it with my favorite neon shorts and added hot pink accessories. I wore these neon shorts in this past post. 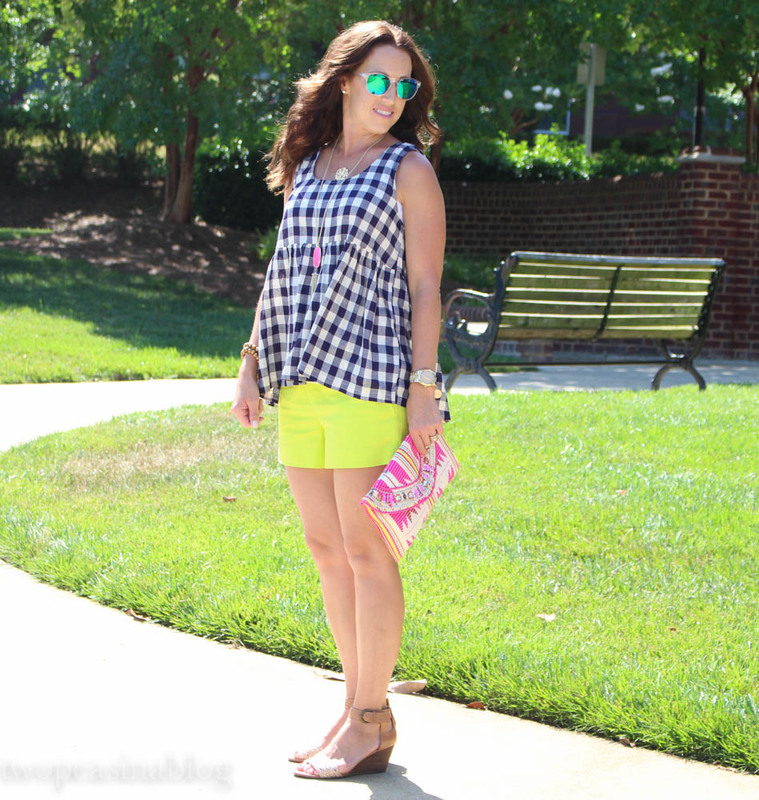 I must have a thing for neon yellow and navy!! They just pair so nicely together. But I love these shorts. They are a fabulous material that really doesn't wrinkle and the best part is the elastic waist! Yes, elastic. So comfy! Thanks. The clutch is from Francesca's Boutique earlier this spring. 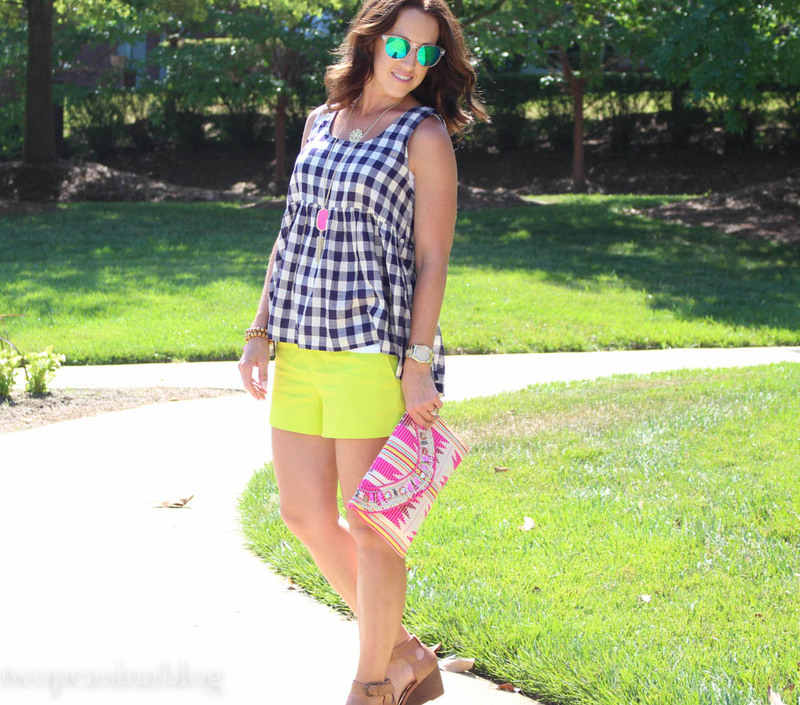 Love the mix of classic gingham with neon - so fun! Such a fun look! 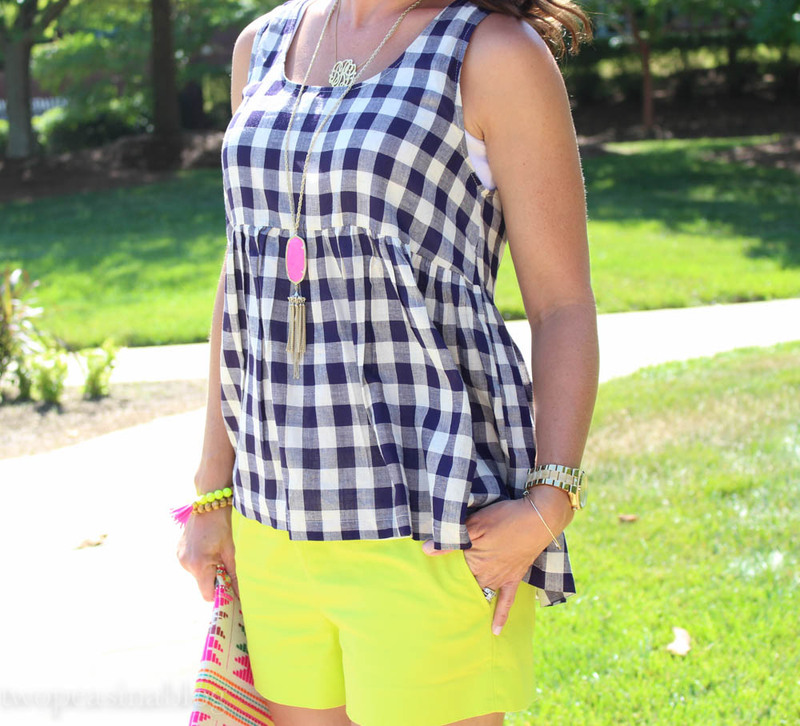 I love gingham for Summer!!! This look is adorable and I love this clutch! love it! 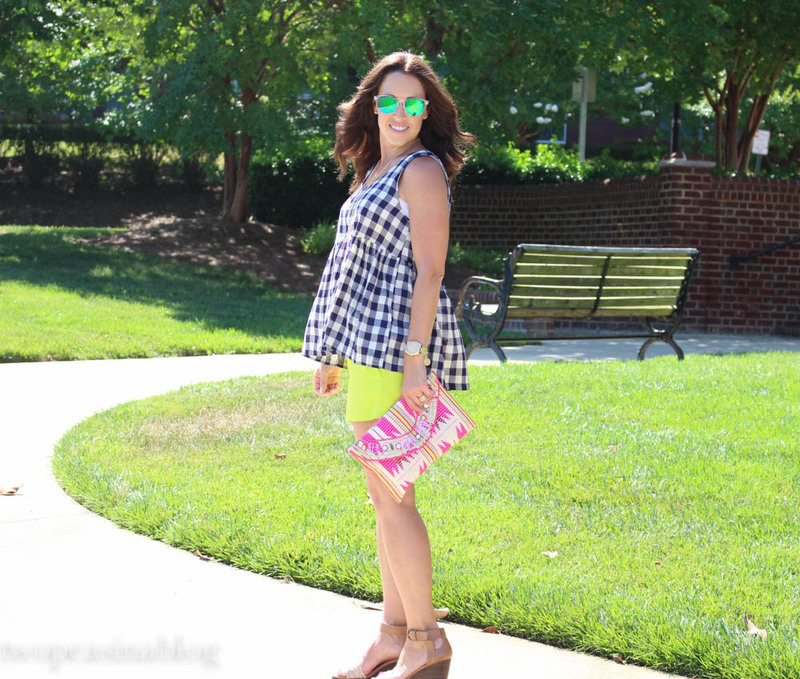 I have been looking for some gingham too! You are always on top of the trends!! such a nice look! 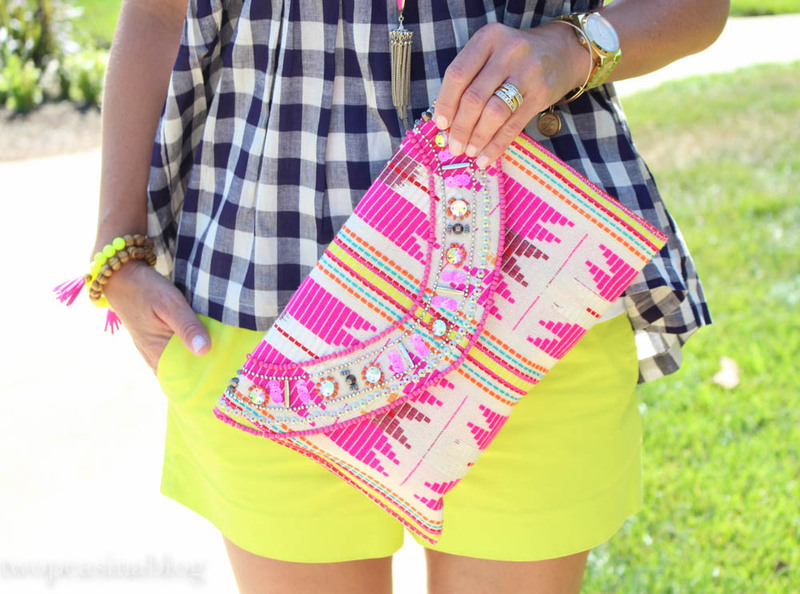 love the clutch and the jewelry! you look stunning! love the outfit head to toe! I love the contrast of prints in the top and the clutch! That gingham top is too cute and I am loving the colors!! Hi good to meet you, love the shape of this top and gingham! I need to wear mine.The bag is so cute too!